The Low Energy Transmission Grating (LETG ) was developed under the direction of Dr. A.C. Brinkman in the Laboratory for Space Research (SRON) in Utrecht, the Netherlands, in collaboration with the Max-Planck-Institut für Extraterrestrische Physik (MPE) in Garching, Germany. The grating was manufactured in collaboration with Heidenhaim GmbH. The Low Energy Transmission Grating Spectrometer (LETGS) comprises the LETG, a focal-plane imaging detector, and the High Resolution Mirror Assembly discussed in Chapter 4. The Chandra High Resolution Camera spectroscopic array (HRC-S) is the primary detector designed for use with the LETG. The spectroscopic array of the Chandra CCD Imaging Spectrometer (ACIS-S) can also be used, though with lower quantum efficiency below ∼ 0.6 keV and a smaller detectable wavelength range than with the HRC-S. The High Energy Transmission Grating (HETG) used in combination with ACIS-S offers superior energy resolution and quantum efficiency above 0.78 keV. The HRC is discussed in Chapter 7, the ACIS in Chapter 6, and the HETG in Chapter 8. The LETGS provides high-resolution spectroscopy (λ/∆λ > 1000) between 80 and 175 Å (0.07-0.15 keV) and moderate resolving power at shorter wavelengths. The nominal LETGS wavelength range accessible with the HRC-S is 1.2-175 Å (0.07-10 keV); useful ACIS-S coverage is 1.2 to roughly 60 Å ( ∼ 0.20-10 keV). A summary of LETGS characteristics is given in Table 9.1. The LETGS provides the highest spectral resolving power ( > 1000) on Chandra at low (0.07-0.2 keV) energies. High-resolution X-ray spectra of optically thin plasmas with temperatures between 105 and 107 K, such as stellar coronae, reveal a wealth of emission lines that provide diagnostics of temperature, density, velocity, ionization state, and elemental abundances and allow precise studies of structure, energy balance, and heating rates. Absorption features provides similar information in cases where bright compact X-ray sources are embedded in cooler, extended gas clouds. The high resolution (∆λ ≈ 0.05 Å) of LETGS spectra at longer wavelengths (\mathrel > 100 Å) also permits detailed studies of spectral line profiles in the X-ray region. These studies may provide non-thermal velocities of stellar coronae, flow velocities along active-region loops, orbital velocities in X-ray binaries, and upflow velocities in stellar flares. The LETGS also allows time resolved spectroscopy, 1-D spatially resolved spectra, and spectra of multiple point sources within its ∼ 4 arcmin field of best focus . Since the ultimate spectral resolution can only be achieved for point sources, the prime candidates for study in our Galaxy mainly comprise stellar coronae, white dwarf atmospheres, X-ray binaries, and cataclysmic variables. Extragalactic sources include relatively bright active galactic nuclei (AGN) and cooling flows in clusters of galaxies. Flat transmission gratings were flown aboard Einstein and EXOSAT. The LETG grating elements are produced using a technique similar to that used for production of the EXOSAT gratings. However, the LETG shares only basic operating principles with earlier instruments. Advanced grating technology has enabled the achievement of greater efficiency and increased dispersion. The Rowland geometry (see Figure 8.4) of the grating plate and spectroscopic arrays reduces dispersed image aberrations and hence contributes to improved spectral resolution. When inserted behind the HRMA, the LETG diffracts X-rays into a dispersed spectrum according to the grating diffraction relation, mλ = psinθ, where m is the integer order number, λ the photon wavelength, p the spatial period of the grating lines, and θ the dispersion angle. Parameters are summarized in Table 9.1. The grating facets are mounted on an aluminum support plate which has been machined so that the centers of individual grating facets lie on a Rowland torus. The grating facets are aligned to produce a single dispersed image. Spectral resolution is determined, among other factors, by grating line density, line density variations, HRMA point-spread function, pointing stability, alignment accuracy, pixel size of the read-out detector, and detector geometry. When the LETG is used, the Grating Element Support Structure (GESS ), an aluminum frame approximately 110 cm in diameter and 6 cm thick, is inserted ∼ 300 mm behind the exit aperture of the HRMA and 1.4 m behind the HRMA mid-plane. The GESS holds approximately 180 trapezoidal grating modules, which measure about 13 × 50 mm. A design drawing of the full GESS is shown in Figure 9.1; a closer view, showing some mounted modules, is seen in Figure 9.2. Figure 9.3 shows empty grating modules mounted on the GESS. 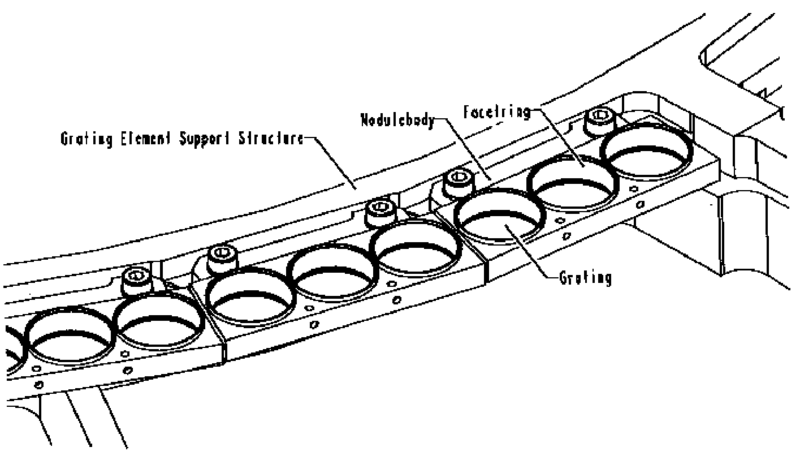 Each grating module holds three circular grating facets, each of which comprises approximately 80 of the triangular grating elements seen in Figure 9.4. 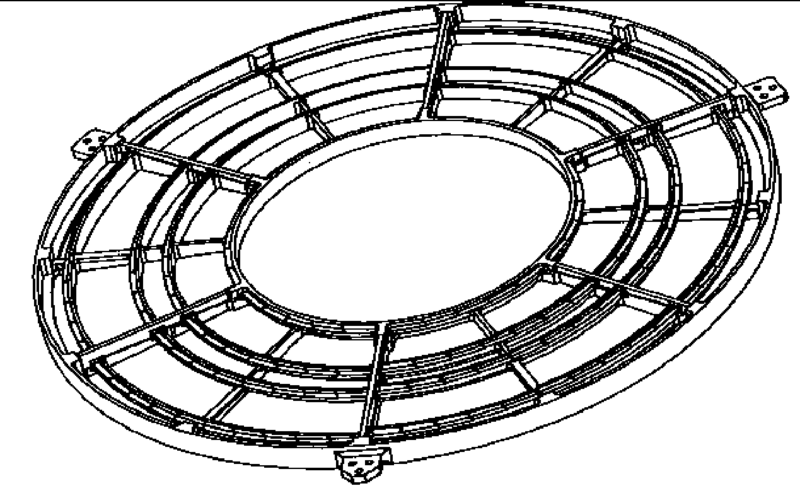 Figure 9.1: LETG Grating Element Support Structure, a machined aluminum plate approximately 110 cm in diameter that holds grating modules on a Rowland torus behind the Chandra mirrors. Figure 9.2: Detail of the LETG Grating Element Support Structure showing grating modules mounted on the inner annulus. Figure 9.3: A closeup view of the LETG GESS showing nearly three complete grating modules. Each module holds three circular grating facets, and each facet contains approximately 80 triangular grating elements. In contrast to the HETG gratings, which have a thin polyimide substrate, the LETG gratings are free-standing wires held by a support mesh. Within each grating facet the grating bars are supported by perpendicular "fine support" bars and triangular "coarse support" bars. The parameters of these structures are given in Table 9.1. A schematic of the grating structure is shown in Figure 9.4. Both the fine and coarse grating supports act as long-period transmission gratings themselves. As discussed in Section 9.3.7 and illustrated in Figures 9.23, 9.24, and 9.27, the fine support produces a dispersion pattern perpendicular to the grating dispersion direction and the coarse support produces a six-pointed star pattern. Figure 9.4: LETG facet structure schematic showing the basic shape of the individual grating elements and the relative sizes of the support structures. 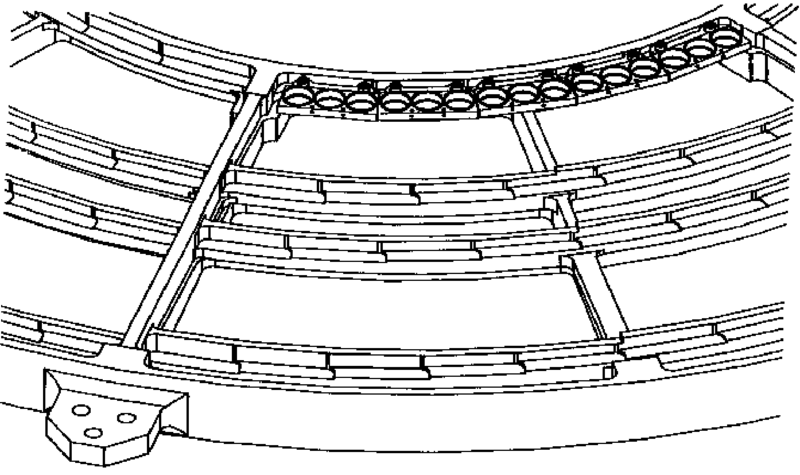 The upper view shows the complete grating element, which comprises the triangular coarse support, the vertical fine supporting bars, and the (horizontal) grating bars. The grating bars themselves are not shown to scale. In the upper view every 50th grating bar is drawn, in the lower view every 10th bar. Since the gratings are produced from a single master mask, there is negligible variation in the period between facets. The thickness of the gold of the grating bars on top of the support mesh determines the "phasing," or efficiency of redistribution of photons into each spectral order in wavelengths where the gold is partially transparent. The thickness is designed to optimize the 1st order response at energies of interest. 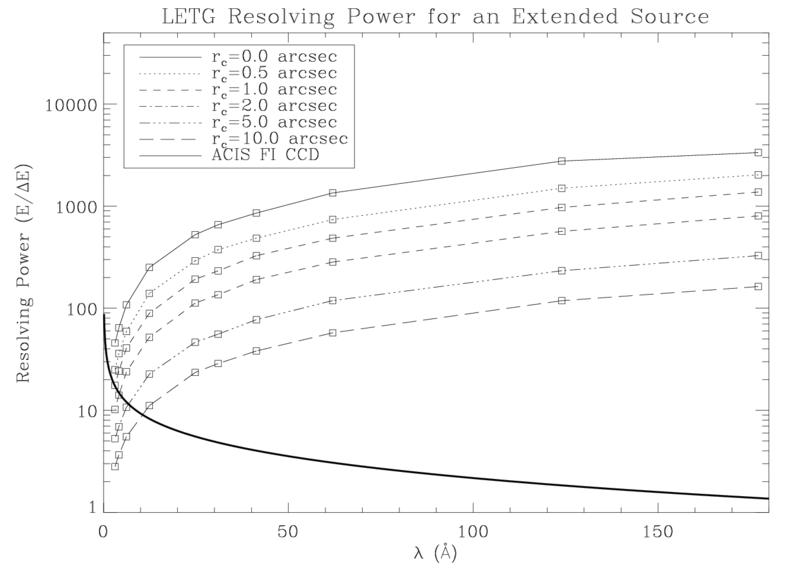 To reduce aberrations, the GESS is shaped to follow the Rowland torus. The basics of the Rowland geometry are shown in Figure 8.4. The primary read-out detector (HRC-S ) is made of three tilted array segments which also follow the Rowland circle in the image plane (see Figures 7.2 and 9.5). Because the detector array elements are flat, the distance from the Rowland circle changes with position, and so the spectral resolution changes very slightly with wavelength. The secondary read-out detector, ACIS-S, has 6 CCDs, each of which is only one-quarter as long as an HRC-S segment, so the ACIS-S array follows the Rowland circle even more closely. Figure 9.5: The front surfaces of the HRC-S detector segments and their relationship to the Rowland circle are shown schematically. The scalloped line beneath them is the difference between the detector surface and the Rowland circle. Prior to assembly, individual grating elements were tested using a visual light spectrograph at the MPE. Laboratory calibration of grating period and resolution was performed for individual grating elements at optical wavelengths, and extrapolated to the X-ray range. Grating efficiencies at X-ray wavelengths were modeled using near-infrared spectrophotometry, and verified by X-ray measurements of a sample of facets. Grating facet and module alignment was also tested. LETGS efficiency, resolution, and line response function were tested at the X-ray Calibration Facility at MSFC in Huntsville, AL for both ACIS-S and HRC-S configurations. Absolute energy scale and off-axis response were also measured. Efficiency and the Line Spread Function (LSF) of the LETG and HRMA/LETG subsystem were characterized using a detector system designed for HRMA calibration, the HRMA X-ray Detection System (HXDS). Details may be found in the XRCF Final Report at http://cxc.harvard.edu/cal/Hrma/XRCFReport.html. In-flight calibration of the LETGS, along with its primary detector, the HRC-S, is planned and executed by the CXC LETG team. LETG first-light and focus observations were of the active late-type binary Capella whose coronal spectrum is rich in narrow spectral lines (see Figure 9.26). Spectra of Capella, the late-type star Procyon (F5 IV), and serendipitous Guest Observer targets have been used in calibration of the LETG dispersion relation, resolving power, line response function, and grating-detector alignment. Calibration of the LETGS effective area (EA) and HRC-S quantum efficiency (QE) at energies above the C-K edge (0.28 keV, 44 Å) relies primarily on observations of the quasar continuum source PKS 2155-304 and (earlier in the mission) 3C 273 and Capella. PKS 2155-304 also has been regularly observed with LETG/ACIS-S to monitor contamination buildup on ACIS (see Section 6.5.1) and for cross calibration with other X-ray missions. Mkn 421 largely replaced PKS 2155-304 as an ACIS contamination monitoring source starting in 2010. RX J1856 (neutron star continuum source) is also used for contamination monitoring. For calibration of the LETG/HRC-S EA at longer wavelengths, observations of the hot DA white dwarfs HZ 43 and Sirius B are used. Early in the mission, most calibration targets were observed at least twice per year to monitor LETGS operation, but calibration observations are now less frequent. Regularly observed sources and monitoring frequencies are listed in Table 9.2. Other targets are occasionally observed to meet specific calibration needs that might arise, and ACIS-S and HRC-S (see Table 7.5) are routinely calibrated by themselves (i.e., without gratings). The primary use of the LETG is for on-axis observations of point sources, which produce a zero-order image and a dispersed spectrum. Typical LETGS observations range from a few tens to several hundred ksec. To reduce the (small) risk that the grating mechanism might fail, its frequency of use is minimized by grouping grating observations into consecutive time blocks whenever possible. The net LETG transmission is ∼ 28% at energies below ∼ 1 keV (about 12.5% for zeroth order, the same for 1st order, and a few percent for all other orders) so count rates are usually not a concern with respect to exceeding detector limits or telemetry saturation. However, some bright sources (e.g. Sco X-1) if observed for long exposure times could cause significant charge depletion in the HRC MCPs (see Chapter 7, especially Section 7.13), and even moderate rates may cause pile-up problems when using ACIS-S (see Sections 6.16 and 9.4.1). Some observers may find it useful to insert the LETG for imaging observations simply to reduce the detected photon count rate. In standard operation, the LETGS uses either the HRC-S or ACIS-S as its detector. The LETG+HRC-S covers a wavelength range of approximately −165 to +175 Å in 1st order for on-axis sources. This wavelength range can be shifted somewhat by offset pointing, but image quality degrades substantially beyond about 2′. The HRC-S does not have sufficient energy resolution to allow sorting of overlapping spectral orders. In rare cases it might be useful to use the HRC-S Low Energy Suppression Filter (LESF), as discussed in Section 9.4, in order to obtain a predominantly higher-order (m > 1) spectrum. The LESF is a region on the HRC-S UV/Ion Shield (UVIS) where the aluminum coating is relatively thick, and corresponds to the upper part of the "T" in Figure 7.1. Note that the Al coating on the LESF is thicker on the outer plates than on the central plate. See Figures 9.17 and 9.19 for the effect of the LESF on 1st and higher order effective areas. When used with the ACIS-S detector, the effective LETGS wavelength coverage is reduced because of the smaller detector size in the dispersion direction (ACIS-S is only half as long as the HRC-S) and the fact that the two outermost chips (S0 and S5) have essentially zero QE for detecting 1st order LETG photons (see Figure 9.6). Another consideration is that ACIS has worse temporal resolution than HRC, which may be important when observing periodic or rapidly varying sources. On the other hand, ACIS has a much lower background and its intrinsic energy resolution allows easy separation of diffraction orders. Note that the CTI-degraded energy resolution of the ACIS FI CCDs (Section 6.7) does not pose a problem for LETG point-source observations, because order separation effectively eliminates energy uncertainties. Figure 9.6: LETGS 1st order effective area (EA) with ACIS-S and HRC-S, showing plus and minus orders separately; lower panel shows low-EA regions in more detail. The effects of dither and ACIS bad columns are included. EAs for LETG+ACIS-S are shown for spectra centered on row 512 (SIM-Z=0 mm, Z-offset=0′). See Section 9.4.2/SIM-Z Offsets and Offset Pointing for more information regarding the choice of ACIS row and Y-offset. Dotted lines mark ACIS chip boundaries, and HRC plate gaps appear near −53 Å and +63 Å. ACIS curves are for Y-offset=+1.2′ and HRC curve is for Y-offset=0′. The LETG+HRC EA is decreasing ∼ 0.5% per year at all wavelengths, while the LETG+ACIS EA is slowly falling because of increasing contamination on the ACIS Optical Blocking Filters. Note the abrupt decline beyond +27 Å as longer wavelengths fall on the FI S4 chip, while the BI S1 chip provides useful EA for several Å longward of the C-K edge at −44 Å. Y-offsets may be chosen to tailor the coverage of BI chips (S1 and S3), which have significantly higher QE at low energies than the FI chips. See also Figure 9.17, which plots effective areas for combined plus and minus orders. In some special cases, the HRC-I may also be used with the LETG. A detailed discussion of the various merits of LETGS detector choices from a point of view of proposal planning is given in Section 9.4. Because the LETGS is essentially an objective-grating system, it is possible to do multi-object spectroscopy, although as noted above, the point-spread function degrades rapidly off-axis. To include or reject secondary sources, or to avoid overlapping diffraction from multiple sources, observers may specify the orientation (roll angle) of the grating dispersion direction on the sky (see Chapter 3). Observations of extended sources are also possible, but at the expense of resolving power and with the loss of the simple relation between position and energy. In angular extent, the standard HRC-S spectroscopy read-out region is 3.37′ x 101′, and the full ACIS-S array covers 8.3′×50.6′. In special cases, a different HRC-S detector "window" (up to twice as wide in cross-dispersion) may be selected, as described in Section 9.4. 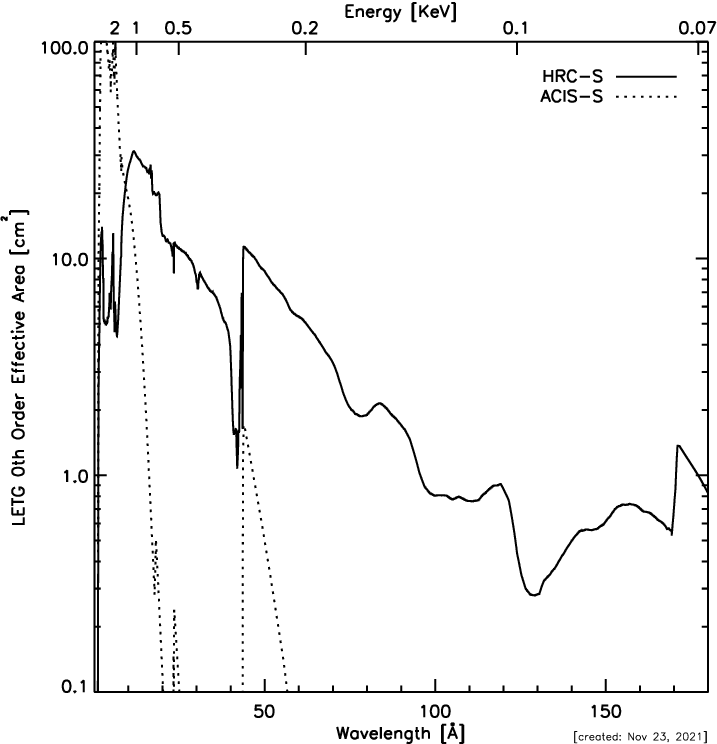 The active extent of the HRC-S in the dispersion direction is 296 mm, almost exactly twice that for the ACIS-S. The nominal zeroth-order aimpoints for each detector are slightly offset from the detector center so that gaps between the three HRC-S segments (six ACIS-S segments) will occur at different wavelengths in negative and positive orders. A Y-axis offset (along the dispersion axis) of +1.2′ is recommended for most LETG+ACIS-S observations in order to shift coverage of longer wavelengths onto the backside-illuminated S1 and S3 chips, which have higher QE at low energies than the other ACIS-S chips. With a dispersion of 1.148 Å/mm for the LETG, the standard wavelength range of the LETGS with HRC-S is −163 Å to +175 Å. Physical coverage with ACIS-S extends from −88 to +84 Å when using Y-offset=+1.2′, but the poor low-E response of the outlying front-illuminated chips limits the effective wavelength range to −59 Å for negative 1st order and less than about +27 Å for the positive order (see Figure 9.6). Outlying chips may be useful, however, for collecting higher-order spectra. Wavelength coverage can be adjusted (increasing the wavelength range on one side and decreasing on the other) by changing the central offset (the observatory Y coordinate-see the discussion in Chapter 3) although spectral resolution degrades rather quickly beyond about 4′ from the optical axis. From the information in Table 9.1, one can derive the relationship between angular offset (in the dispersion direction) and wavelength as 3.36 Å per arcmin, so an offset of 10′ would stretch the positive order HRC-S coverage to approximately 210 Å (60 eV). While the vast majority of LETG observations have been made with offsets of less than 2′, flight LETG calibration data have been collected at 5′ off-axis (for resolution testing) and 10′ off-axis (for effective area calibration). As noted in Section 9.3.2, there are gaps between detector segments which create corresponding gaps in the wavelength coverage of each order. The gaps in + and − orders do not overlap so that the combined wavelength coverage is continuous. The locations of the gaps (neglecting the effects of dither) are listed in Table 9.3, which also lists the locations of the HRC-S UV/Ion Shield inner "T" filter edges. Dithering the spacecraft will partially smooth these gaps, but observers may wish to adjust the source pointing if a favorite line falls in a gap, or to tune the wavelength coverage of the higher-QE back-illuminated (S1 and S3) ACIS-S chips. Standard HRC dither amplitude (full width, in both directions) is 40′′ (1.95 mm), which covers 2.3 Å, and standard ACIS dither is 16′′ (0.78 mm), or 0.9 Å. Please see the "Checking your LETG/ACIS Obscat Setup" web page at http://cxc.harvard.edu/cal/Letg/ACIS_params. An interactive tool for visualizing spectral feature placement on the ACIS array as a function of Y-offset and source redshift is available there. Table 9.3: LETG Position-Dependent Spectral Coverage (1st Order). Energies and wavelengths for the negative order are given in parentheses. Listed values are for the most commonly used pointing (on-axis for HRC-S and Y-offset = +1.2′ for ACIS-S) without dither. Standard dithering affects ±1.1 Å on the edge of each HRC-S segment and ±0.45 Å on the edge of each ACIS chip. Uncertainties are of order 0.5 Å and arise mostly from thermally induced pointing errors, which have been increasing over time; shifts of ∼ 1 Å have been seen. Note that the QE for FI ACIS chips is much lower than for BI chips at low energies, rendering S0, S4, and S5 of limited use (see Figure 9.6). Please see http://cxc.harvard.edu/cal/Letg/ACIS_params for up-to-date and detailed information regarding offset pointing, wavelength ranges, and pointing errors. Overall wavelength calibration is accurate to a few parts in 10000 across the full wavelength range of the instrument, and the Rowland diameter has remained stable since launch. The RMS deviation between observed and predicted wavelengths for a set of relatively unblended lines observed in Capella spectra amounts to 0.013 Å, after correction for the relative spacecraft and Capella radial velocity differences. Through analysis of accumulated calibration and GO observations, some remaining differences between predicted and observed line wavelengths have been found to be caused by small event position errors at some locations on the HRC-S detector. Position errors occur in both dispersion and cross-dispersion axes, though for spectroscopy the latter are usually not important because data are generally summed in the cross-dispersion direction. The magnitude of position errors in the dispersion axis for the central HRC-S plate range from 0 to ∼ 0.05 Å, with typical errors of ∼ 0.01-0.02 Å . The outer plates ( > 60 Å ) tend to exhibit larger errors of typically ∼ 0.02-0.08 Å. The size of the position errors changes over spatial scales of the HRC read-out taps, which are 1.646 mm apart (see Chapter 7 for details of the HRC). Spacecraft dither moves dispersed monochromatic photons of a given order over a region of the detector that is roughly 2mm square. Within any given dither region, then, monochromatic light will fall on detector regions that have different position determination errors. As a result, a narrow spectral line could suffer some distortion of its line profile and/or a small shift of its apparent wavelength. Such distortions or shifts could occur at the spacecraft dither frequency (see Chapter 5); observers should therefore exercise caution in interpretation of such periodic effects. Care should also be taken when interpreting the results of combined spectra from + and − orders, since these effects are not symmetrical about zeroth order. The position errors appear to be stable in detector coordinates and to repeat in different observations for which the aimpoints are very similar. An empirical correction for the effect based on accumulated calibration and GO observations has been derived and is implemented in CALDB 3.2.0 as part of the HRC-S degap map. Details on the derivation of the wavelength corrections can be found on the "Corrections to the Dispersion Relation" page at http://cxc.harvard.edu/cal/Letg/Corrlam. After correction, the RMS deviation between observed and predicted line wavelengths observed in Capella are reduced from 0.013 to 0.010 Å across the entire wavelength range of the instrument. Corrections for the outer plates ( > 60 Å) are much less effective owing to a lack of reference lines with adequate signal-to-noise ratio. For the central plate alone, the RMS deviation amounts to 0.006 Å . For the purposes of observation planning, it should be assumed that individual observed line wavelengths could be in error by up to about 0.02 Å for λ < 60 Å, and 0.05 Å for λ > 60 Å. Despite the observed repetition in pattern from observation to observation, observers are reminded that the exact wavelength error for any given line depends on the exact position of the target on the detector. Small differences in actual aimpoint that occur naturally between observations as a result of uncertainties in aspect and target acquisition (see Chapter 5) mean that wavelength shifts for a specific line are not generally repeatable from one observation to another and might also be subject to small secular trends. The dominant contribution to the LETGS line response function (LRF) and instrument resolving power is the HRMA point-spread function (PSF), which is ∼ 25 μm FWHM, depending on energy. The next most important factor is the detector PSF, which is ∼ 20 μm FWHM for the HRC-S, with 6.43-μm-wide pixels; ACIS pixels are 24 μm wide. Uncertainties in correcting photon event positions for the observatory aspect, which occurs during ground data processing, adds a small contribution of order a few μm. Finally, the small errors in event position determination resulting from HRC-S imaging non-linearities described in Section 9.3.2 can lead to some distortion of spectral line profiles. These effects are difficult to quantify in detail but are estimated to affect the line FWHM by less than 25%. When all these effects are combined, the LETGS line response function is generally ∼ 40 μm FWHM. With a conversion of 1.148 Å/mm for the LETG, a good figure of merit for LETGS resolution is therefore 0.05 Å. Because the three segments of the HRC-S can not perfectly follow the Rowland circle (see Figure 9.5), however, resolution varies slightly along the detector, and is lowest near the ends of each detector segment. Resolution degradation is almost negligible when using the ACIS-S, since its six segments more closely follow the Rowland circle, although the coarser ACIS pixel size (24 μm vs. ∼ 40-μm-FWHM LRF) means that line profiles are barely adequately sampled. A plot of LETGS resolving power for an on-axis point source, based on results from an observation of Capella, is shown in Figure 9.7. Figure 9.7: LETG spectral resolving power, as derived from observations of Capella (ObsIDs 1248, 1009, 58) and Procyon (ObsIDs 63, 1461) with the HRC-S. The analysis is based only on spectral lines thought not to be affected significantly by blending at the LETGS resolution. Measured line widths were corrected for source orbital, rotational, and thermal motions. The dashed line is an optimistic error budget prediction calculated from pre-flight models and instrument parameters. The conservative solid curve is based on in-flight values of aspect, focus, and grating period uniformity. The deviations from approximate linearity near ±60 Å and at the longest wavelengths arise from deviations of the HRC surface from the Rowland circle (see Figure 9.5). Deviations in the experimental data from a smooth curve are likely caused by hidden blends not predicted by the radiative loss model and by detector imaging nonlinearities discussed in Section 9.3.2.
where λ0 is the wavelength of the line center and Γ is a measure of the line width. The relation between Γ and the line FWHM depends on β. For a Lorentzian profile, or β = 1, the profile FWHM is Γ/2. For the value β = 2.5 recommended here, FWHM ≈ 1.13Γ. Figure 9.10 illustrates the χ2 of fits to the zeroth order profile versus β, and shows a best-fit profile with an index of ∼ 2.5. (Note that β = 1.0 yields a Lorentzian profile.) The best fit to the very high signal-to-noise-ratio zeroth order profile is far from being statistically satisfactory. However, spectral lines seen in first order generally contain orders of magnitude fewer counts than in the zeroth order of the well-exposed calibration spectrum shown, and the Moffat function nearly always provides a good match. Line response functions can also be generated within CIAO in the RMF FITS format. These are based on ray trace simulations using the MARX program and generally match observed line profiles to a level of 10% or better once intrinsic source broadening terms have been taken into account. Observers wishing to use line profile shapes as a diagnostic tool should keep in mind that, in the case of LETG+HRC-S observations, non-linearities in the HRC-S imaging can lead to significant distortions of observed line profiles (see Section 9.3.2). 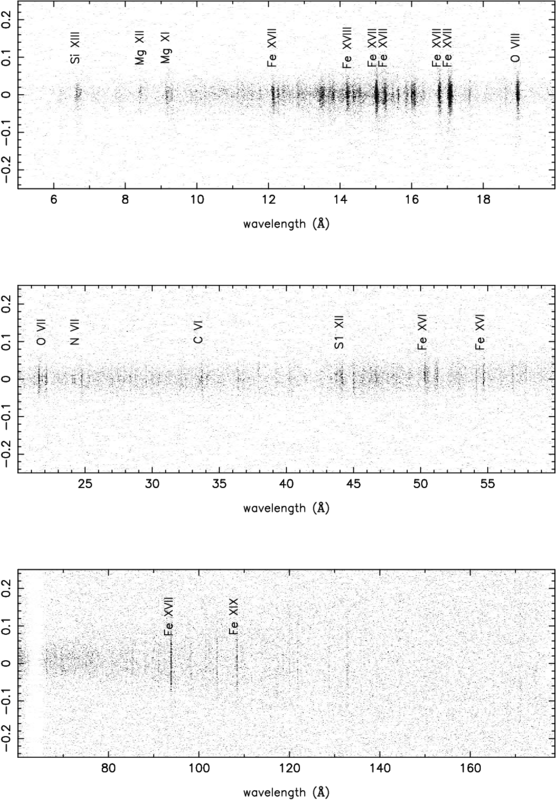 Figure 9.8: Observed LETG zeroth-order LRF from in-flight calibration observations of the active late-type binary Capella. 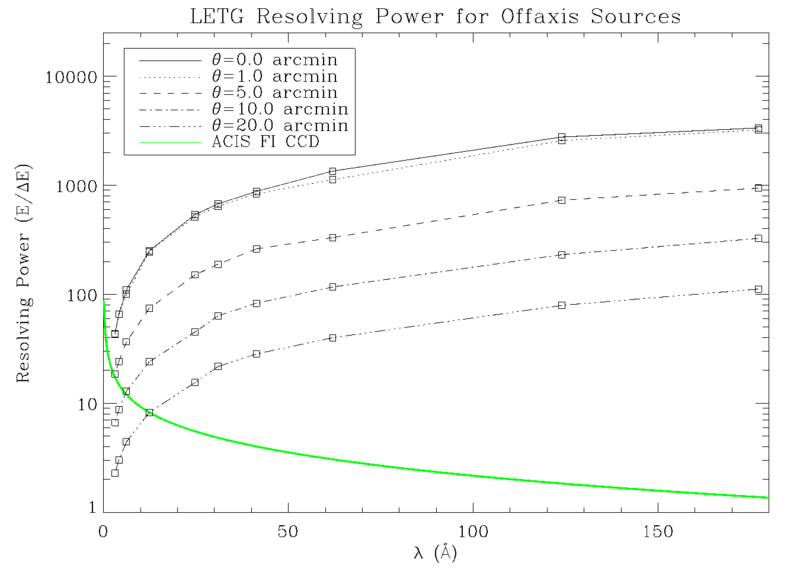 The model profile, the continuous curve, is a Moffat function (see Equation 9.1) corresponding to the best-fit value of β = 2.5. While this function represents a statically-poor fit to this extremely high S/N zeroth-order profile, it is a good approximation to the LRF for lines in the dispersed spectrum containing many fewer counts. Figure 9.9: LETGS line response function as illustrated by two bright Fe lines (Fe XVII at ∼ 17 Å and Fe XVIII at ∼ 94 Å ) using in-flight calibration observations of Capella. 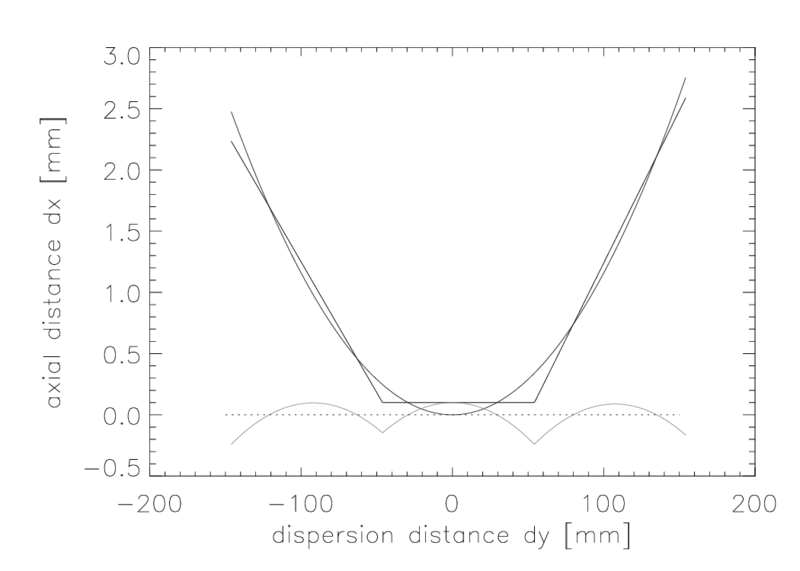 The solid curves are best-fit Moffat functions with β = 2.5. 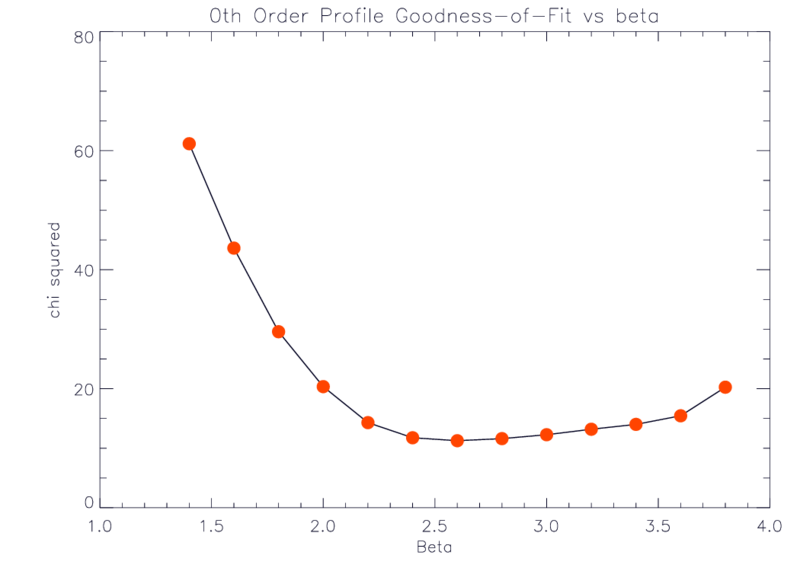 Figure 9.10: LETGS zeroth order profile goodness of fit vs. β, showing a best-fit profile with an index of ∼ 2.5 (see Equation 9.1). If a source is extended, there is no longer a unique mapping between the position of an event in the focal plane and wavelength, and this results in the apparent degradation of spectral resolving power. For very large sources, the grating resolution may be no better than the intrinsic ACIS energy resolution. The effect of increased source size on the apparent LETG spectral resolving power has been simulated using the MARX program, and results are shown in Figure 9.11. Another illustration of the effect of source extent may be seen in Figure 9.30 (Section 9.4), which shows model spectra over a small wavelength range. Figure 9.11: LETG spectral resolving power for extended sources. The predicted LETG resolving power (E/∆E) is shown versus wavelength for several source sizes. The MARX simulator has been used, and the source is represented by a β model (Equation 9.2). For comparison, the spectral resolution for ACIS front-illuminated CCD chips is shown (thick solid line). Note that the ACIS/FI curve does not include the effects of CTI, which progressively degrades resolution away from the read-out edge (most of this degradation can be compensated for in data analysis). where I(r) is the surface brightness, r is the radius, and rc characterizes the source extent. The value of β was set to a typical value of 0.75 and simulations were performed for different values of the source extent, rc. Similarly, for sources off-axis, the increased point-spread function decreases the spectral resolving power. The effect on off-axis sources has been simulated with MARX and is shown in Figure 9.12. Figure 9.12: LETG spectral resolving power for off-axis sources. The predicted LETG resolving power (E/∆E) is shown versus wavelength for various off-axis distances. For comparison, the spectral resolution for ACIS front-illuminated CCD chips is shown. Note that the ACIS/FI curve does not include the effects of CTI, which progressively degrades resolution away from the read-out edge. As with extended sources, an ACIS pulse-height spectrum may, in extreme cases, provide energy resolution comparable to or better than the LETG for a source far off-axis. As explained in Section 9.1, the LETG has fine and coarse support structures which are periodic in nature, and have their own diffraction characteristics. The fine support structure disperses photons perpendicularly to the main spectrum, with about 1/26 the dispersion of the main grating. The coarse support is a triangular grid, and creates a very small hexagonal diffraction pattern which is generally only discernible in zeroth order or for very bright lines. Examples of this secondary diffraction are visible in Figures 9.23, 9.24, and 9.27, all in Section 9.3.7. The two support structures each diffract roughly 10% of the X-ray power, but the coarse-support diffraction pattern is so small that essentially all its photons are collected along with the primary spectrum during spectral-region extraction in data analysis. 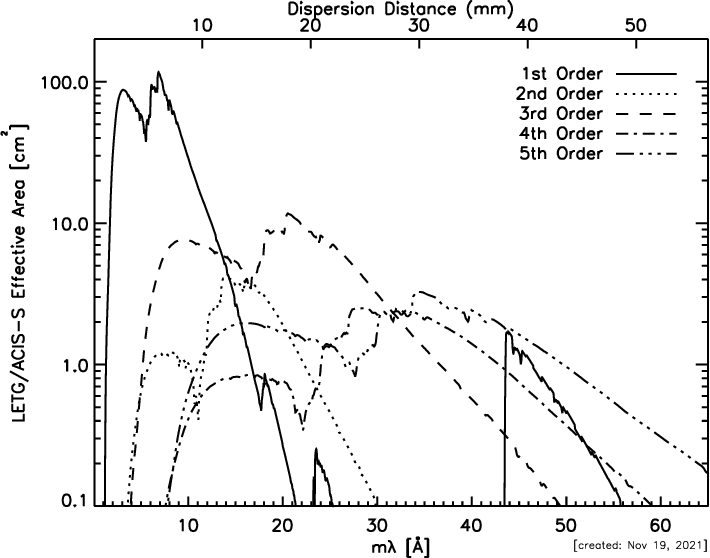 A significant fraction of the fine-support diffraction pattern, however, may lie outside the spectral extraction region, resulting in a loss of several percent of the total X-ray intensity (see, e.g., Figure 9.23). The fractional retention of X-ray power in the source extraction region is referred to as the spectral extraction efficiency and is discussed in Section 9.3.5. The zeroth and 1st order grating efficiencies are based on a rhomboidal grating bar analytical model and verified by ground calibration. Higher orders have been calibrated relative to 1st order using flight data. 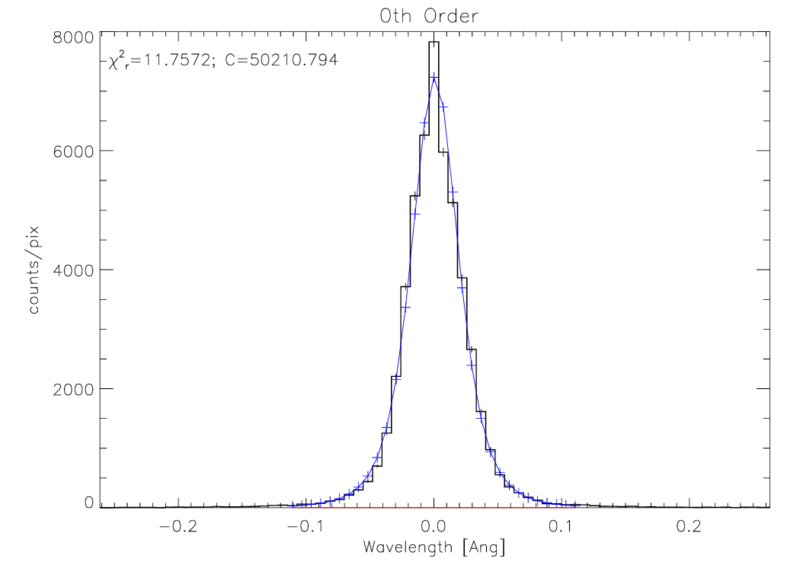 Plotted values (Figure 9.13) are for the total diffraction efficiency (including photons diffracted by the coarse and fine support structures), with negative and positive orders summed. Even orders are generally weaker than odd orders up through roughly 6th order. Figure 9.13: LETG grating efficiency. Combined positive and negative order efficiency is plotted versus wavelength and energy. For clarity, even and odd orders are plotted separately; the sum of orders 11-25 is also shown. Plotted values include all support structure diffraction. Net efficiency when using a spectral extraction region (see Figures 9.14 and 9.15) is 10-15% lower. Features near 6 and 80 Å are due to the partial transparency of the gold grating material at these wavelengths. The wiggles near 80 Å, and the stronger features near 6 Å, arise from partial transparency of the gold grating material to X-ray photons. Note that there are no absorption-edge features from C, N, or O in the LETG efficiency as there are in the HETG, because the LETG does not use a polyimide support film. The LETGS effective area for any diffraction order is equal to the product of the HRMA effective area, the net LETG efficiency for that order (including spectral extraction efficiency), and the overall detector efficiency (which varies slightly depending on exactly where the diffracted spectrum falls on the detector). For LETG/ACIS-S there is an additional factor, the Order Sorting Integrated Probability (OSIP), which is determined by the width of the ACIS-S energy filter for each diffraction order. All these quantities vary with wavelength. Of the contributors listed above, the HRMA EA (see Chapter 4) is the best calibrated within the LETGS energy band. The largest contributor to the LETG/HRC-S effective area uncertainty is the efficiency of the HRC-S, especially at longer wavelengths ( > 44 Å ; < 0.28 keV) where ground calibration is very difficult or impossible. In-flight calibration (see Section 9.2.2), particularly of the net 1st order effective area, has provided the best and most extensive data, and the effective area is now believed to be accurate to a level of approximately 10-15% or better across the entire bandpass. Effective areas for orders 2-10 have been calibrated relative to 1st order to an accuracy of 5-10% (best for 3rd order and generally worsening with increasing m) using flight data. Uncertainties for λ\mathrel < 6 Å, mλ\mathrel > 80 Å, and orders beyond 10th may be larger but are usually unimportant. The QE of both the ACIS-S and HRC-S detectors is slowly decreasing over time (see Sections 6.5.1 and 7.9), and so the LETGS effective areas are also time dependent, as reflected in the CALDB (beginning with CALDB 4.4.5 for the HRC-S). The ACIS-S QE decrease is caused by a thickening layer of contaminant on the detector's Optical Blocking Filter, and is most apparent at low energies. As of 2016, it is recommended that LETG+ACIS-S spectra be centered on row 512 (SIM-Z=0) instead of row 180 (SIM-Z=-8 mm) in order to sample a region of ACIS-S with thinner contaminant and therefore higher effective area (see Figure 9.6 and Section 9.4.1/ACIS-S). The HRC-S decrease of ∼ 0.5% per year is largely independent of energy and believed to be caused by charge extraction across the entire detector (mostly from cosmic ray background events), with a slightly higher rate of decrease around the aimpoint and at wavelengths longer than ∼ +140 Å. In addition to fixed-position detector features (primarily detector segment gaps-see Section 9.3.2) there are instrumental spectral features which occur at fixed energies because of absorption edges in the materials comprising the HRMA, LETG, and HRC-S or ACIS-S. The edges are tabulated in Table 9.4 and can be seen in the effective area curves (such as Figure 9.17) as decreases or increases in effective area depending on whether the material is part of the mirror, the filter, or the detector. Every effort has been made to adequately calibrate Chandra over its entire energy range, but it should be understood that effective areas near absorption edges are extremely difficult to quantify with complete accuracy and uncertainties in these regions are inevitably higher. In practice, it is impossible to "put back" photons which undergo secondary diffraction (from the coarse and fine support structures) in a real observation. Instead, one defines an extraction region for the observed spectrum and adjusts the derived spectral intensities to account for the fraction of total events that are contained within the extraction region. Figure 9.14: A MARX simulation of a flat spectrum illustrating the broadening of the LETG+HRC-S profile in the cross-dispersion direction, and showing the "bow-tie" spectral extraction window. Note that the vertical axis is highly stretched and that the true diffraction pattern has some minor asymmetries. The default extraction region for LETG+ACIS-S spectra (not shown) is rectangular with a half-width of 0.12 mm. Figure 9.15: Spectral extraction efficiencies for LETG+ACIS for various extraction region half-widths (tg_d units are deg). The default spectral extraction region is | tg_d | < 0.0008 deg. Approximately 10% of the total power is diffracted by the fine-support structure and most of it falls outside the extraction region; the peaks toward shorter wavelengths reflect the inclusion of progressively higher orders of cross-dispersed events within the extraction region. The otherwise general trend of declining efficiency toward short wavelengths is caused by increased scattering. The slight fall-off beyond ∼ 60 Å is due to astigmatism, i.e., an increasing fraction of events are lost as the dispersion pattern broadens (see Figure 9.14). The default extraction region for the LETG+ACIS-S configuration is a rectangle; that for the LETG+HRC-S configuration is "bow-tie" shaped, comprising a central rectangle abutted to outer regions whose widths flare linearly with increasing dispersion distance (see Figure 9.14). The shape of the bow-tie has been roughly optimized to match the astigmatic cross-dispersion that is a feature of Rowland-circle geometry, with the goal of including as much of the diffracted spectrum as possible while minimizing the included background. Extraction efficiencies for LETG+ACIS are illustrated in Figure 9.15. The extraction efficiency for the LETG+HRC bow-tie is 85-86% at most wavelengths. For custom analysis (such as when narrower or wider extraction regions are needed), CIAO permits adjustment of spectral and background regions by the user. A narrower extraction region optimized for the analysis of low-S/N spectra is available at http://cxc.harvard.edu/cal/Letg/LetgHrcEEFRAC. Whatever spectral region is chosen, CIAO computes the extraction efficiency and includes it as a factor in the Response Matrix File (RMF). Users then apply this RMF together with the effective area from the CIAO-computed Ancillary Response File (ARF) during subsequent analysis. Although the HRC-S is the default detector for the LETG, other detector configurations are possible. Figures 9.16 and 9.17 show effective areas for the LETG zeroth and 1st orders, respectively, when using the HRC-S, HRC-S with LESF, or ACIS-S as the read-out detector. Based upon these and other plots, the various trade-offs as to the use of each detector are thoroughly discussed in Section 9.4. Users interested in the low energy response using ACIS should read carefully the discussion in Section 6.5.1. Figure 9.16: LETGS zeroth-order effective area for an on-axis point source for the LETG with HRC-S and ACIS-S detectors. The zeroth-order effective area for the HRC-S/LESF combination is the same as for the HRC-S. LETG+ACIS-S areas include the effects of time-dependent contamination. Figure 9.17: LETGS 1st-order effective area for an on-axis point source, with HRC-S, HRC-S/LESF, and ACIS-S detector configurations with log (top) and linear (bottom) scaling. Positive and negative orders are summed. LETG+ACIS-S areas include the effects of time-dependent contamination. Note that the vertical scale of the linear plot has been truncated. Figure 9.18: The combined LETG/HRC-S effective area, illustrating the relative strengths of 1st and higher orders, plotted versus mλ (top) and λ (bottom). Positive and negative orders are summed. Light shading in the top panel marks plate gaps around mλ = −53 and +64 Å. See the text for an example of how to determine the relative strength of overlapping lines from different orders, and http://cxc.harvard.edu/ciao/threads/hrcsletg_orders/ for color figures and further information. Figure 9.19: The combined HRMA/LETG/HRC-S/LESF effective areas for 1st and higher orders. Positive and negative orders are summed. Figure 9.20: The combined HRMA/LETG/ACIS-S effective areas for 1st and higher orders. LETG+ACIS-S areas include the effects of time-dependent contamination. Positive and negative orders are summed. Differences in the LETGS effective area for off-axis and significantly extended sources compared to the on-axis point source case are primarily determined by the HRMA vignetting function (see Chapter 4). Although the LETG (and HETG) have been designed to reduce complications from higher-order diffraction by suppressing even orders, many grating spectra will have overlapping diffraction orders. When ACIS-S is used as the detector, its intrinsic energy resolution can be used to separate orders. The situation is more complicated, however, with HRC-S, which has very little energy resolution. Detector options and various data analysis techniques are described in Section 9.4. The relative contribution of higher-order photons with different detector configurations can be estimated by inspection of Figures 9.18, 9.19, and 9.20. As an example, say an observer plans to use the LETG/HRC-S configuration and wants to determine the intensity of a line at 45 Å, but knows that line may be blended with the 3rd order of a 15 Å line which has 10 times the emitted intensity of the 45 Å line. Looking at Figure 9.18, we read the 1st- and 3rd-order curves at mλ = 45 Å and see that the 3rd-order value is about one-tenth the 1st-order value. Multiplying by 10 (the ratio of the emitted intensities of the 15 and 45 Å lines), we compute that ∼ 50% of the feature at mλ = 45 Å will come from the 15 Å line. A fuller explanation, with color figures and more examples for the LETG/HRC-S with line and continuum sources, can be found at http://cxc.harvard.edu/ciao/threads/hrcsletg_orders/. The LETG is always used in conjunction with a focal-plane detector, so LETGS spectra will exhibit that detector's intrinsic, environmental, and cosmic background. The components of the background of the HRC are discussed in Section 7.10. The quiescent background rate over the full detector varies with the solar cycle (see Figure 9.21) but is always a significant fraction of the 183 cts s−1 telemetry limit. Imposition of the HRC-S spectroscopy window reduces the rate to between 55 and 130 cts s−1, as discussed below. To avoid constant telemetry saturation, the HRC-S is operated in a default, windowed down "edge-blanking" configuration, in which data from only 6 of the 12 coarse taps in the center of the detector in the cross-dispersion direction are telemetered (see Section 7.10.2). The edge-blanking creates an active detector area slightly less than 10 mm, or 3.4 arcmin, in the cross-dispersion direction. This window easily accommodates the (dithered) dispersed spectra of point sources; other windows may be specified for extended sources or other special cases. As long as the total count rate is below the 183 cts s−1 telemetry limit, detector deadtime is negligible (and recorded as a function of time in the secondary science .dtf files-net exposure time is recorded in the image FITS file header). During background "flares" arising from an increased flux of solar wind particles, however, the background rate may rise above the 183 cts s−1 telemetry limit. During these times detector deadtime may become significant. Current data processing algorithms correct for this deadtime with a typical accuracy of ∼ 10% or better. Time resolution approaching 16 μsec can be achieved with the HRC if the data rate is below telemetry saturation. To leave ample margin for telemetry in case of background flares, a special Imaging Mode (see Section 7.11) is used for high-resolution timing observations. This mode utilizes only the central region of the HRC-S detector and provides a field of view of approximately 7′ × 30′. However, if telemetry saturation does take place then the time resolution with HRC-S is approximately the average time between events. The quiescent background rate in HRC-S Level 2 data varies by more than a factor of two over a solar cycle (see Figure 9.21). A "typical" rate of 1.0×10−6 cts s−1 pixel−1 corresponds to 5.76 × 10−5 cts s−1 arcsec−2, or 0.10 cts/pix in 100 ks. The extent of a dispersed line in the LETGS spectrum is approximately 0.07 Å (9.5 pixels) and the spectral extraction region is 25 to 85 pixels wide in the cross-dispersion direction; the typical background rate therefore yields 24 to 81 background cts beneath the line in a 100 ks exposure. However, the HRC-S pulse height distribution is sufficiently narrow that a large fraction of pulse-height space can be excluded from the data to further reduce the background, which has a relatively broad pulse-height distribution. Data collected or reprocessed in the Archive after 2010-Jun were processed with a time-dependent HRC-S gain map, which allows use of an associated pulse-height filter. This filter removes more than half of the Level 2 background at wavelengths longer than 20 Å, with a loss of only 1.25% of X-ray events (see Figure 9.22). Details, including instructions on how to reprocess older data, may be found at http://cxc.harvard.edu/cal/Letg/Hrc_bg. Note that the HRC-S high voltage was raised in 2012-Mar. The gain map for observations after this date is not as accurate as before because temporal trends are not yet well established. The background filter is still safe to use but will be slightly less effective on these post-HV-change data. The gain map will be refined as more calibration data become available. 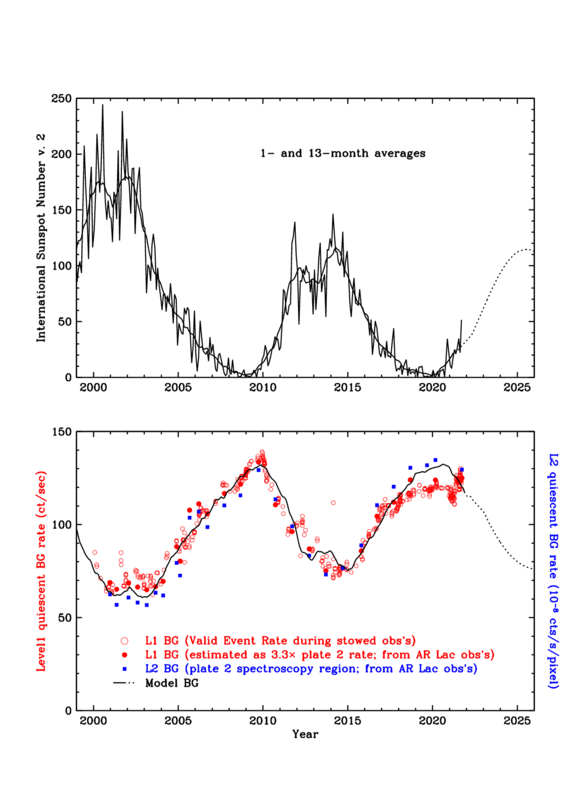 Figure 9.21: Solar cycle and HRC-S background. Top: Monthly sunspot numbers and with 13-month smoothing; dotted curve is predicted. Bottom: Level 1 background rate is for the LETGS standard spectroscopy region, derived from AR Lac monitoring data (without a grating) and from NIL-mode observations when the HRC-S is in the stowed position. The "typical" Level 2 (L2) rate is 1.0×10−6 cts s−1 pixel−1, but this varies with the solar cycle. L1 and L2 background rates are not exactly correlated because of changes in the effectiveness of L1-to-L2 filtering over time. 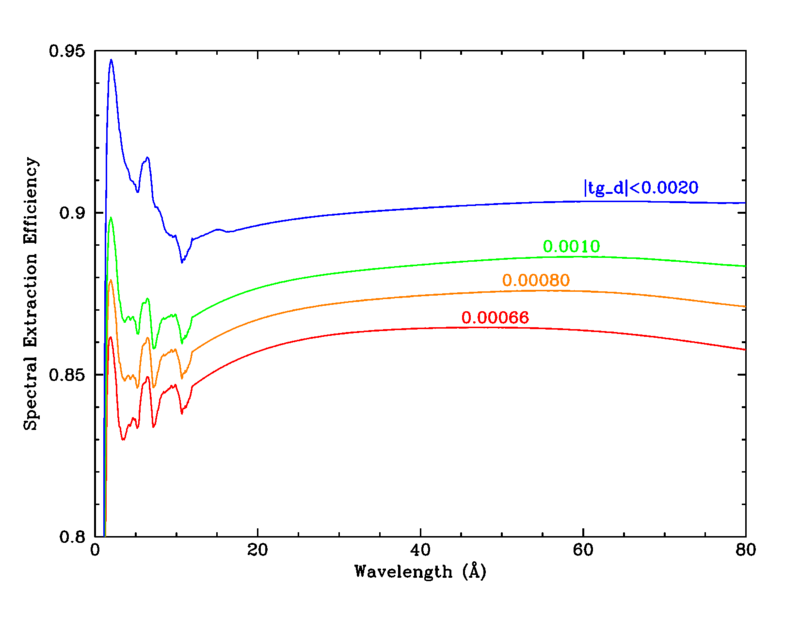 The continuous black curve represents a simple model of the HRC-S background rate based on sunspot number with a 1-year lag (or 0.7 years after the 2009 solar minimum) corresponding to the approximate time for the solar wind to reach the heliopause, where its magnetic field helps deflect cosmic rays from entering the solar system. Rates in Figure 9.22 correspond to a Level 2 rate of 1.1×10−6 cts s−1 pixel−1. Figure 9.22: The 2008-Jan LETG+HRC-S background rate with and without pulse-height filtering. These Level 2 rates correspond to 1.1×10−6 cts s−1 pixel−1 (see Figure 9.21). Data are shown using the standard `bowtie' spectral extraction region (see Figure 9.14). X-ray losses from the observed spectrum as a result of the filtering for 1st order are ∼ 1.25%; losses will be slightly higher for higher orders. See http://cxc.harvard.edu/cal/Letg/Hrc_bg for more information. The mean of the pulse-height distribution increases weakly with photon energy, such that a factor of two difference in energy corresponds to a shift in the mean of ∼ 8%. The mean of 8th order will therefore be about 25% higher than 1st order; the PI filter removes 1.25% of 1st order at 160 Å, and about 11% of 8th order (λ = 20 Å, mλ = 160 Å). Extra filtering of higher orders will have negligible effect for nearly all analyses, but should be considered if deliberately studying wavelength ranges with very heavy higher order contamination. There are two backgrounds relevant for the LETG/HRC-S. The first is the Level 1 data event rate over the 3-plate standard spectroscopy region, which is 55-130 cts s−1 during quiescence (see Figure 9.21), but can rise during background `flares' to cause telemetry saturation when the total (background plus sources) rate reaches 183 cts s−1. The other is the filtered Level 2 background rate in the extracted spectrum. A "typical" rate of 1.0×10−6 cts s−1 pixel−1 (see Figure 9.21) corresponds to ∼ 10-25 cts (depending on wavelength-see Figure 9.22) in a 0.07 Å spectral bin per 100,000 s integration during quiescence, which may be used for estimating signal-to-noise (see also the discussion in Section 9.5.1). There is a third background rate which will be of interest when high time resolution (sub-msec) is required, which is the count rate before any on-board screening is applied. See Sections 7.11 and 7.14.1 for more information on the HRC-S Timing Mode. As with the HRC-S detector, background rates in ACIS are somewhat higher than expected, but lower than in the HRC. Pulse-height filtering applied during order separation further reduces the effective ACIS-S background to extremely low levels when used with gratings. The reader is directed to Chapter 6 for further discussion. Figure 9.23 is a detector image from an 85 ksec LETGS observation of Capella (ObsID 1248). The central 30 mm of the dispersion axis and the full extent of the telemetered cross-dispersion window (9.9 mm) is shown. Lines radiating from zeroth order above and below the primary dispersion axis are due to fine-support structure diffraction, and the six-pointed star around zeroth order is from coarse-support diffraction. (See Section 9.1.4 for a description of the LETG support structures.) Figure 9.24 is a close-up of the bright Fe XVII, Fe XVIII, and O VIII lines between ∼ 15-17 Å, in which many orders of fine support diffracted flux can be seen. Figure 9.23: HRC-S detector image of LETGS observation of Capella. Vertical axis is stretched by a factor of 1.6 relative to horizontal; only the central 30 mm of the central plate is shown. The full extent of the telemetered six-tap cross-dispersion window is shown and measures 9.9 mm. The areas of reduced background at top and bottom are due to dither effects. Star-shaped coarse support structure diffraction is seen around zeroth order, and "cat's whiskers" fine support structure diffraction is seen above and below the primary dispersion axis, as well as in the vertical line through zeroth order. Figure 9.24: Detail of Figure 9.23, showing the LETG/HRC-S image of bright lines in Capella. Vertical and horizontal scales are identical. The Fe XVII lines at ∼ 15 and 17 Å are the brightest in the LETG Capella spectrum. Faint features above and below the primary spectrum are due to fine support structure diffraction. 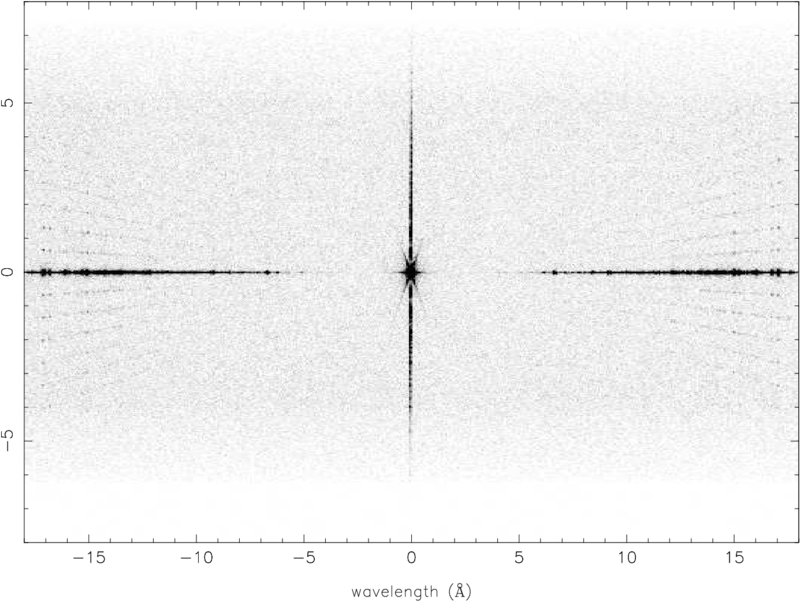 Figure 9.25 is an HRC-S image of a second Capella observation (ObsID 1420, 30 ksec), showing positive order dispersion. The increasing cross-dispersion extent of lines at longer wavelengths is due to astigmatism in the HRMA/LETG system (see also Figure 9.14). The positive order HRC-S plate gap is seen at ∼ 63 Å. An extracted Capella spectrum (ObsID 62435, 32 ksec), is shown in Figure 9.26. Figure 9.25: HRC-S detector image of a Capella observation, showing positive order dispersion. Images in the top, middle, and bottom panels are horizontally compressed by factors of 11, 28, and 84 respectively. The increasing cross-dispersion extent of lines at longer wavelengths is due to astigmatism in the HRMA/LETG system. The positive-order HRC-S plate gap is at ∼ 63 Å. Figure 9.26: Extracted LETGS spectrum of Capella with some line identifications (from Brinkman et al. 2000, ApJ, 530, L111). Many of the lines visible between 40 and 60 Å are 3rd order dispersion of the strong features seen in 1st order in the uppermost panel. Positive and negative orders have been summed. Figure 9.27 is a zeroth-order image of summed Sirius AB observations (ObsIDs 1421, 1452, 1459) with a total exposure time of 23 ksec. The star-shaped pattern is due to coarse support structure diffraction. Sirius A and B are separated by ∼ 4′′. The flux from Sirius A is due to the small, but non-zero, UV response of the detector. 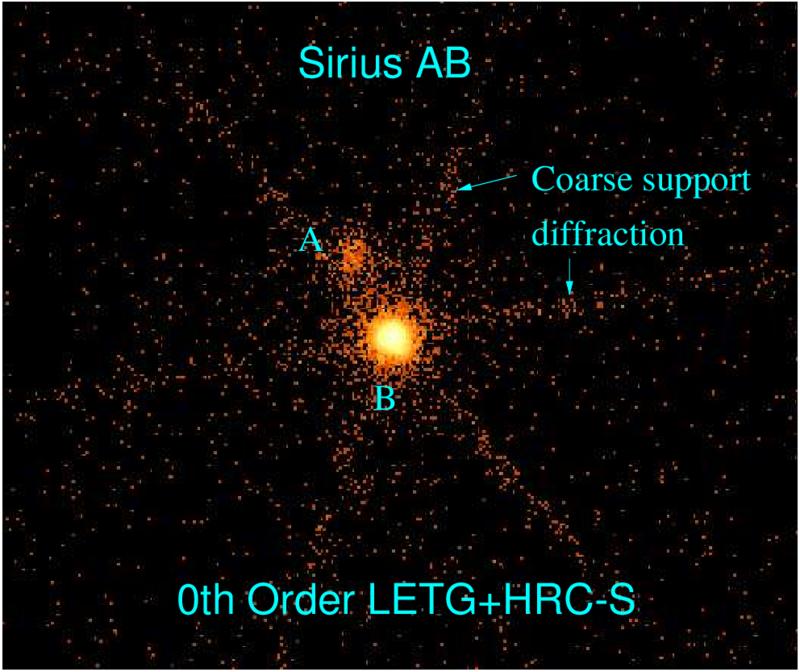 Figure 9.27: LETG/HRC-S zeroth order image of Sirius A and B. The two stars are separated by ∼ 4′′. Flux from Sirius A is due to the small but finite UV response of the detector. The star-shaped structure is due to coarse support diffraction. The purpose of this Section is to provide further information directly related to planning LETGS observations that is not explicitly presented in Sections 9.1 and 9.3, and to reiterate the most relevant issues of instrument performance that should be considered when preparing an observing proposal. Those proposing an LETG+ACIS-S observation should read the http://cxc.harvard.edu/cal/Letg/ACIS_params page. After an LETG proposal is accepted, CXC User Support scientists will work closely with observers to ensure an optimal instrument set-up. The best choice of detector will depend on the exact application; some considerations are listed below. For further details concerning the HRC and ACIS detectors, refer to Chapters 7 and 6, respectively. We remind readers that contamination build-up on the ACIS detector has significantly reduced the effective area of the LETG+ACIS-S combination for wavelengths > 20 Å compared to that at launch. In this regard please be sure to read the discussion in Section 6.5.1. The HRC-S provides wavelength coverage from 1.2-175 Å (10-0.07 keV). The HRC-S QE is smaller than that of ACIS-S in the 1.2 to ∼ 15 Å (0.8-10 keV) range, but larger at longer wavelengths (see Figures 9.6 and 9.17). The HRC-S provides the highest time resolution at 16 μs when telemetry saturation is avoided. The probability of avoiding saturation is significantly improved if only the central plate is utilized (see Section 7.11). The HRC-S suffers from small position non-linearities which may slightly distort or shift spectral features (see Section 9.3.2). HRC-S has essentially no intrinsic energy resolution and so overlapping spectral orders cannot be separated. The Level 1 HRC-S background count rate is typically 100 cts s−1 in its windowed-down spectroscopic configuration during quiescence. (See Figure 9.21 for how this varies over the solar cycle). However, this can rise to exceed the HRC telemetry saturation limit of 183 cts s−1 during background "flares". During telemetry saturation, deadtime is determined to an accuracy of 5-10%. Background flares can also be filtered out using CIAO or other software tools. These flares have been seen to affect 10-20% of some observations. Typical fractions are smaller than this; larger fractions are rare. If observing a very bright source where telemetry saturation is a concern, one can use a smaller than standard region of the detector (see Section 9.4.2). The LESF filter region in principle can be used to obtain a higher-order spectrum relatively uncontaminated by 1st order for wavelengths above 75 Å (E < 0.17 keV; see Figure 9.17). This could be useful either for observing features in a high order for high spectral resolution that cannot be easily observed with the HETG/ACIS-S combination, or for providing a direct observation of higher order contamination in conjunction with an LETG+HRC-S observation in its nominal configuration. NB: the LESF configuration has never been used in flight. -the highest time resolution is required. When used with the LETG, the HRC-I provides wavelength coverage from 1.2-73 Å (10-0.17 keV). The raw HRC-I quiescent background event rate per unit area is lower than that of the HRC-S by about a factor of 4. After moderate filtering in both detectors, the ratio is about a factor of 2. This may be important for very weak sources. The HRC-I imaging capabilities are similar to those of the HRC-S, but its single flat detector plate cannot follow the Rowland geometry as well as the HRC-S. At nominal focus this results in slightly poorer spectral resolution for wavelengths > 50 Å. In principle, small focus offsets can be used to optimize the focus of the dispersed spectrum either within a specific wavelength range, or to average defocus blurring over the full wavelength range. No simple focus optimization prescription currently exists; interested readers should contact the CXC for assistance. The details of the LETG+HRC-I effective area have been less well-studied in general than for the LETG+HRC-S combination. The polyimide used in the HRC-I UV/Ion shield is about twice as thick as that used with the HRC-S, resulting in lower transmission at long wavelengths. The HRC-I offers a broad detector in the cross-dispersion direction and this might be a consideration for observation of sources with extended components exceeding ∼ 2 arcmin or so. Note, however, that the Chandra spectrographs are slitless, and the effective spectral resolution is severely degraded for large sources (see Figure 9.11). -a larger detector area in the cross-dispersion direction than is provided by the HRC-S is required. Contamination build-up on the ACIS-S detector has significantly reduced the effective area of the LETG+ACIS-S combination at energies less than ∼ 1 keV since launch (see Section 6.5.1 for details). ACIS-S provides an effective LETG 1st order wavelength limit of about 60 Å (0.20 keV) because longward of this the ACIS-S QE is essentially zero (see Figures 9.6 and 9.17). ACIS-S is not as well-calibrated for wavelengths longward of the C edge ( ∼ 44 Å). The intrinsic energy resolution of ACIS-S allows for discrimination between different and otherwise overlapping spectral orders. For dispersion longward of mλ ∼ 60 Å the LETG+ACIS-S response is dominated by higher order throughput (Figure 9.17) and ACIS-S can therefore be useful for observing these higher spectral orders. ACIS-S allows several modes of operation (see Section 6.13) including continuous clocking (CC) if high time resolution is desired, or to avoid pile-up. If using the full frame 3.2 s exposure of ACIS-S in TE mode, photon pile-up can be a serious consideration, especially in zeroth order. Proposers should also be aware that there is a potential for pile-up in bright lines and continua and not assume that, because of dispersion, the flux is too spread out to be affected. For observations using Y-offset=+1.4′, the fraction of 1st order events lost to pile-up in a continuum spectra can be estimated as event rate (in cts/frame/dispersion-axis-pixel) times 3 for FI chips; times 4 for BI chips. As an example, if the count rate of the 1st order spectrum is expected to be 0.01 cts/frame in a wavelength interval of 0.0275 Å (one pixel wide along the dispersion axis), about 3% of those events will be lost to pile-up (in FI chips). While the example rate is observed only in very bright continuum spectra (such as Mkn 421 near 6.5 Å), pile-up can be a concern for bright features in line-dominated spectra. Some of these events can be recovered by examining higher order spectra but most pile-up events will have "migrated" out of the standard grade set. Pile-up can affect both the shape of the PSF and the apparent spectral energy distribution of your source. Pile-up may be reduced by opting for a "sub-array" that reads out a smaller area of the detector for a decrease in the frame time. See Section 9.4.2 and also Section 6.16 for details concerning pile-up, its effects, and how best to avoid it. ACIS-S time resolution is lower than that of HRC and depends on the control mode adopted. In timed exposure (TE) mode the full frame exposure is 3.2 s. This is reduced when using a subarray due to the shorter read-out time for the smaller detector region (see Section 6.13 for details). Using fewer chips (e.g., dropping S0 and S5 because of their negligible effective area for 1st-order photons) may also slightly reduce the frame time. The highest time resolution possible with ACIS-S (2.85 ms) is obtained in continuous clocking (CC) mode, but imaging information in the cross-dispersion direction is lost and the background will be higher due to the implicit integration over the entire cross-dispersion column of the detector. The energy resolution of the FI chips degrades as distance increases from the CCD read-out because of CTI (see Section 6.7). The LETG dispersion axis is parallel to the ACIS-S read-out and the spectrum of a point source can be placed close to the read-out such that the energy resolution degradation is no longer a significant problem; a default SIM-Z offset of −8 mm is routinely applied to LETG+ACIS-S point source observations. If observations with extended sources are under consideration, or if for other reasons a SIM offset is undesirable, the resolution in the FI CCDs of the ACIS-S array might be a point to consider. 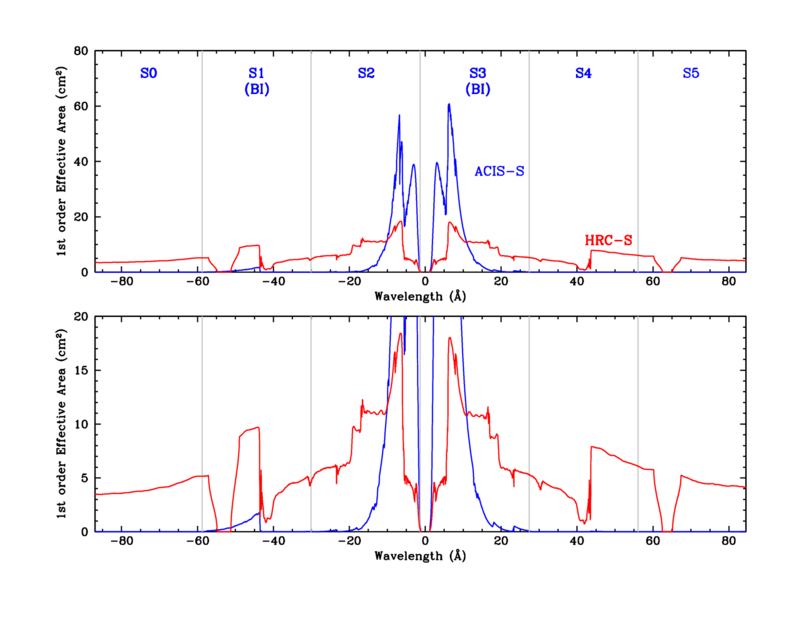 From an LETG perspective, the effects of concern are a degradation of the CCD energy resolution that is employed for order sorting, grade migration that can make for difficult calibration of detector quantum efficiency, and, at longer wavelengths (\mathrel > 50 Å), a loss of events that have pulse heights below that of the ACIS event lower level discriminator. These effects render the effective area at wavelengths longward of the C edge ( ∼ 44 Å) less well-calibrated than at shorter wavelengths. 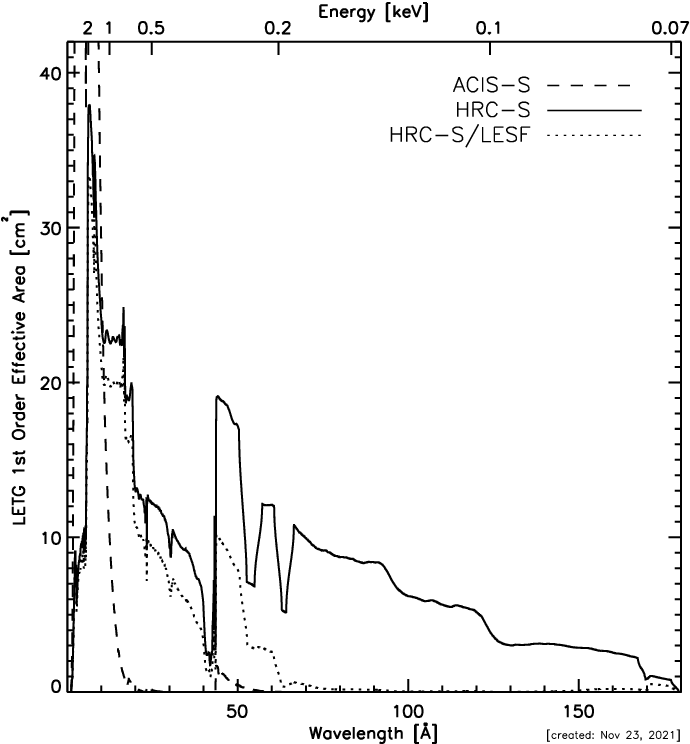 The ACIS-S energy resolution enables removal of the vast majority of background events in LETG spectra; the effective ACIS-S background is consequently much lower than that of HRC-S or HRC-I. -Pile-up can either be avoided or mitigated or is not likely to be a problem. Attention should be paid to the locations of instrument edge features and detector gaps to make sure that spectral features required to achieve science goals are not compromised by these. Calibration in the vicinities of these features is generally much more uncertain. These features and gaps are listed for both HRMA+LETG+HRC-S and HRMA+LETG+ACIS-S combinations in Tables 9.3 and 9.4. Note that intrinsic instrumental features, such as edges, are not affected by dithering and offset pointing (see below), but chip gaps in ACIS-S and HRC-S plate gaps, as well as the boundaries between "thick" and "thin" regions of Al that make the "T" shape of the HRC-S UVIS, are. The standard LETG+HRC-S dither amplitude is 20 arcsec (40 arcsec peak-to-peak; 2 mm in the focal plane or 2.3 Å ) and that of LETG+ACIS-S is 8 arcsec (16 arcsec peak-to-peak; 0.8 mm or 0.9 Å ), in both axes. Spectral features in dispersed LETG spectra will experience the same dither pattern, and allowance for the size of the dither must be made when considering if spectral features of interest will encounter detector gaps. In special cases, different dither amplitudes can be specified by the observer, though it must be kept in mind that detector safety constraints, such as accumulated dose per pore in the HRC (see Section 7.13), must not be violated. The SIM permits movement of the focal-plane detectors in the spacecraft z direction (perpendicular to the LETG dispersion axis). This can be used to better position a source on the ACIS-S or HRC detectors, for example to accommodate multiple sources, or to place a source over the HRC-S LESF filter region. The default SIM-Z value is 0, which places the spectrum along the center of the ACIS-S array where contaminant on the Optical Blocking Filter is thinnest and effective area is highest. Placing the LESF (which has never been used in flight) at the aimpoint requires a SIM-Z offset of +7 mm. Because of the changing thermal environment of the telescope, the aimpoint has drifted over time (see Section 6.11). For several years, observers wishing to make observations at the best focus had to specify small offsets in Y and/or Z pointing. As of late 2015, however, this is no longer necessary as aimpoint position and error are reviewed every two weeks and automatically incorporated into mission planning software. The default Z-offset is therefore 0. Pointing off-axis in the observatory Y axis can be used to change the wavelengths at which detector gaps occur, or to change the wavelength corresponding to the ends of the detectors. Examples of offset pointings are shown in Chapter 3. When choosing offsets, an increase of +1 arcmin in Y-offset corresponds to a shift of +3.36 Å in wavelength. As an example, by invoking a +2 arcmin offset pointing (see Chapter 3 for the convention), the long-wavelength cut-off of the HRC-S can be extended in the + order from approximately 176 Å for on-axis pointing to 183 Å. This, of course, is obtained at the expense of a commensurate shortening of coverage in the − order. 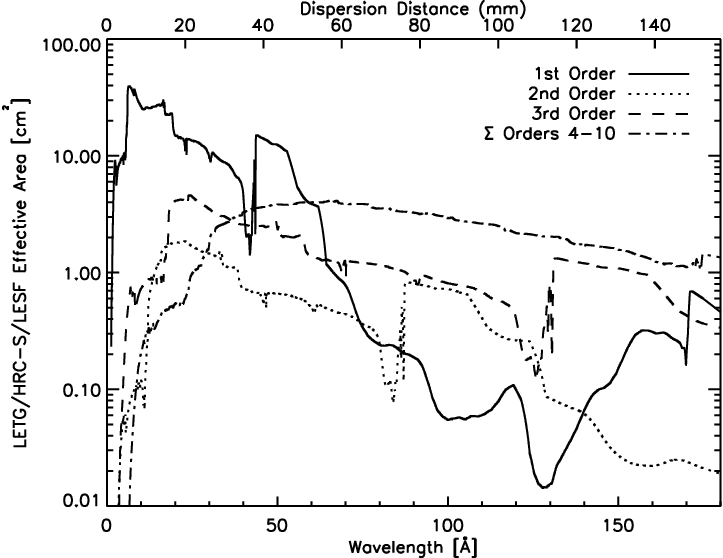 Offset pointing leads to degradation of the PSF, and consequently the spectral resolution-see Figure 9.12. For offsets of 2 arcmin or less this degradation is very small. For offsets of > 4 arcmin, spatial and spectral resolution will be considerably degraded. +0.0′ This is the default Y-offset value and provides the highest possible resolution while avoiding dither across the node0/node1 boundary on the S3 chip. +1.20′ This is the most commonly recommended offset, as it keeps O K-edge features on the S3 backside chip. Spectral resolution is ∼ 15% worse than with Y-offset=0. +1.80′ This approximately centers zeroth order in the gap between S2 and S3 (but keep in mind that pointing errors can be up to ∼ 12′′, with errors of 5′′or less about 90% of the time); a small fraction of zeroth order events will fall on each chip because of dither. This offset can be used to reduce CCD exposure and telemetry demands caused by very bright sources and also provides uninterrupted spectral coverage (apart from chip-edge dither effects around 29 Å) by the BI chips (S1 and S3) from 0 to 57 Å. Spectral resolution is degraded by ∼ 25% (see Figure 9.12). When using the LETG+ACIS-S configuration, a mode must be selected for the ACIS detector. The ACIS detector is very flexible but deciding the best set-up can be complicated. Prospective observers considering using ACIS-S for the focal-plane detector are urged to read Chapter 6 carefully. The most common modes used for LETG+ACIS-S observations are those using sub-arrays. The shorter frame times of subarrays can be a good way to both increase the time resolution and decrease pile-up. Care must be taken when defining subarrays to make sure that the choice of SIM-Z plus any offset pointing in the z direction places the source comfortably inside the subarray. Modes with 256 rows ([1/4] subarray) or fewer are recommended for observations of point (or small) sources, provided that the source position is known to within a few arcsec. Subarrays permit the use of shorter frame times, and thus less pile-up. As an example, a [1/8] subarray (using 6 chips and with the standard SIM-Z offset of −8 mm) requires a frame time of 0.7 s (vs 3.2 s for the full array). Frame times as short as 0.6 s can be used with four ACIS-S chips, or 0.5 s with three chips. See Section 6.13.1 for further information on ACIS frame times. Users should always refer to "Checking your LETG/ACIS-S Obscat Setup" (http://cxc.harvard.edu/cal/Letg/ACIS_params) for the most current information regarding subarray setups. As described in more detail in Section 6.22.1, the continuing gradual degradation of the Chandra thermal environment means that a steadily increasing fraction of observations are experiencing scheduling constraints with regard to the allowable exposure time per orbit. One way to increase the scheduling flexibility of LETG+ACIS-S observations is to use fewer than the full array of 6 CCDs, which reduces the temperature of the ACIS electronics and focal plane. To achieve this, users may denote some ACIS chips as "Optional." In cases where thermal limits might otherwise be breached, Optional chips will be turned off for an observation; this allows Mission Planning more flexibility when setting up observing schedules and makes the process more efficient. Problematic observations with Optional chips are thus less likely to be split into multiple pieces than they would be if all the chips are required. Note that chips S0, S4, and S5 have negligible QE for LETG 1st order dispersed photons (see Figure 9.6); those outer chips are only useful for collecting higher-order spectra, or perhaps in other special circumstances. The web page "Checking your LETG/ACIS-S Obscat Setup" (http://cxc.harvard.edu/cal/Letg/ACIS_params) and the Spectrum Visualizer tool linked there are helpful in determining which CCDs may be unnecessary. The S0 and S5 chips will be turned off in all LETG+ACIS-S observations unless the observer explicitly requests and justifies their use. It is also recommended that S4 be turned off. As described in Section 9.3.6, the HRC-S has a default spectroscopic "window" defined that limits the detector area from which events are telemetered to the ground. The window is a rectangle based on coarse position tap boundaries; the default rectangle comprises the central 6 taps in the cross-dispersion direction (corresponding to ∼ 9.9 mm) and the whole detector length in the dispersion direction. This window can be defined to suit special observational goals, such as if the source is extended and the width of the read-out region must be increased (with increased risk of telemetry saturation during background flares). Likewise, a smaller detector region can be used if, for example, the source is very bright and telemetry saturation is a concern. In such a case, the number of cross-dispersion taps could be reduced, since the source only dithers across 2 or 3 taps. There would be less area for the background extraction region, but with a bright source this would not be a problem. One can also specify that a subset of taps along the dispersion direction be used, particularly if the source spectrum is expected to be cut off at long wavelengths and higher-order spectra are not needed. The most commonly used (though still rare) non-default configuration is simply to use only the central plate with the standard 6 cross-dispersion taps, usually referred to as the Imaging Mode. When considering defining a special HRC-S window, it is reasonable to assume that the detector background is spatially uniform for the purposes of computing the total source plus background count rate. The telemetry capacity of 183 cts s−1 should be kept in mind to avoid telemetry saturation by using a window that is too big. Recently, a minor PSF anomaly has been identified (see Section 4.2.3). It contains only a few percent of the source flux at a separation of 0.8′′ from the main peak and is roughly aligned with the cross-dispersion axis. This anomaly has negligible impact on LETG observations. Field sources coincident with the target source dispersed spectrum should be avoided. While some flexibility in roll angle of order several arcmin can often be accommodated in observation execution, this avoidance is most rigorously accomplished by imposing a roll angle constraint (see below). Note that it is also desirable to retain a pristine region either side of the dispersed spectrum to enable an accurate estimation of the background within the spectral extraction window. In some circumstances, photons from bright sources outside of the direct field of view of the HRC or ACIS might be dispersed by the LETG onto the detector. Particular attention should be paid to optically-bright and UV-bright sources, even if these are some distance off-axis. The ACIS-S and HRC-S filters are much more transparent to optical and UV light than are those of HRC-I and ACIS-I (the HRC-S central "T" segment is closer in performance to that of HRC-I, but has completely different thicknesses of polyimide and Al layers). As an example, an observation of the bright A0 V star Vega (V=0.03) in one of the outer HRC-S UVIS segments gave a count rate of about 475 cts s−1. The energy resolution of the ACIS-S detector enables removal by filtering of all photons except those in a fairly narrow wavelength or energy range corresponding to the wavelength or energy of photons in a spectrum dispersed by the LETG. This means that contamination of the dispersed spectrum by, for example, the zeroth order or dispersed spectrum of other sources might not be a significant problem. However, a much better solution to problems of source contamination is, if it is possible within other observation constraints, to choose a roll angle (Chapter 3) that avoids the source contamination issue. Roll angle constraints can be specified to avoid contamination by off-axis sources, as described above, or to help separate the dispersed spectra of multiple sources in the cross-dispersion direction. The maximum separation between dispersed LETG spectra of two sources is obviously one that places the sources in a line perpendicular to the dispersion axis. Owing to spacecraft thermal degradation and increasing difficulty in scheduling constrained observations, proposers are reminded that only a very limited number of constrained observations can be accommodated. Technical justification for requested constraints must be provided. It is also important to remember that roll angle constraints will also impose restrictions on the dates of target availability as discussed in Chapter 3. Exact restrictions depend on celestial position. Their impact can be examined using the observation visualizer tool, downloadable from the CIAO home page at http://cxc.harvard.edu/ciao/. Scientific Utility: Higher spectral orders provide higher spectral resolving power than the 1st order spectrum by the approximate factor of the order number m. For observations in which features are expected to be seen in higher orders, this capability could be scientifically useful. 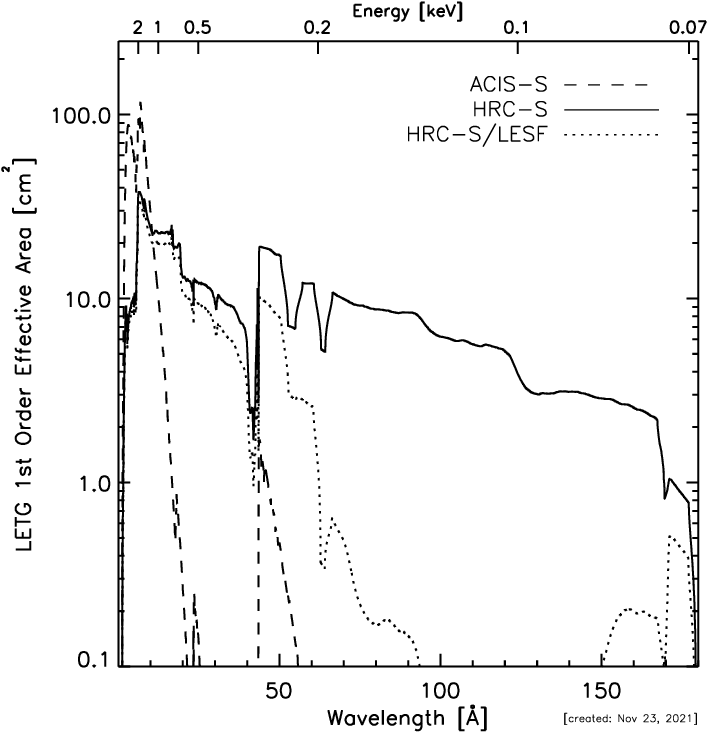 LESF: The LESF (the region of thicker Al coating on the HRC-S UVIS) is untested in flight, but could be useful for obtaining a spectrum containing mostly higher order flux. Source Spectrum: For some sources higher orders will contain very little flux and will not be an issue. Typical examples are hot white dwarfs or relatively cool stellar coronae with T ∼ 106 K. Sources whose spectra are fairly weak in the region where the effective area of the LETG+HRC-S is highest ( ∼ 8-20 Å ; 1.5-0.6 keV) but gain in strength toward longer wavelengths will also be less affected by higher order throughput. Typical examples are blackbody-type spectra with temperatures T ∼ 106 K or less, such as might characterize novae or isolated neutron stars. Estimates: Figure 9.18 can be used to estimate high order contamination. PIMMS can be used for gross estimates of higher order count rates; the PIMMS higher order calculation uses an effective area curve for orders m > 1 combined. Instrumental Capabilities: Order separation is straightforward with ACIS-S. With HRC-S orders cannot be separated. Spectral Modeling and Higher Orders: Unlike ACIS-S, the HRC-S does not have enough energy resolution to allow order sorting of LETG spectra. However, by folding a spectral model through an LETG+HRC-S instrument response that includes all significant higher orders (generally ≤ 10), the whole spectrum can be modeled at once. The capability to generate and simultaneously utilize response matrices for multiple orders (which can be created for plus and minus orders 1-25) is available within Sherpa/CIAO, and these response matrices can also be used with other spectral analysis software such as XSPEC. Note that the response matrices do not include the small-scale wavelength distortions discussed in Section 9.3.2, and hence care must be taken when analyzing some details of line-dominated spectra, particularly line profiles. The long wavelength cutoff of the LETGS in tandem with the HRC-S detector of ∼ 175 Å (which can be extended with offset pointing as described in Section 9.4.2), reaches well into the extreme ultraviolet (EUV). In this wavelength regime, the spectra of even very nearby sources with relatively low ISM absorbing columns can be appreciably attenuated by H and He bound-free photoionizing transitions. Therefore observers should be aware that the effective long wavelength cutoff for anything but the nearest sources ( ∼ 100 parsec or less) will probably be determined by ISM absorption. It is also important to remember that neutral and once-ionized He can dominate the ISM absorption cross-section in the 44-200 Å (0.28-0.062 keV) range, and consideration of the neutral H absorption alone is generally not sufficient. Shortward of the C edge near 44 Å (0.28 keV), metals become the dominant absorbers. For illustration, the ISM transmittance for a "typical" mixture of neutral and ionized H and He with H:He:He+ ratios of 1:0.1:0.01 is shown in Figure 9.28 for the 5-200 Å range with different values of the neutral hydrogen column. Figure 9.28: The ISM transmittance within the LETGS bandpass for different values of neutral hydrogen column density 1017-1022 cm2. The CXC web page has a tool Colden (http://cxc.harvard.edu/toolkit/colden.jsp) that provides the total galactic neutral hydrogen column for a given line-of-sight. The Ahelp page for Colden is located at http://cxc.harvard.edu/ciao/ahelp/colden.html. An IDL routine from the PINTofALE data analysis package for computing the ISM optical depth is available from http://hea-www.harvard.edu/PINTofALE/pro/ismtau.pro. Proposers should always be aware of possible limitations in the physical models and methods they are using for observation planning purposes. For example, older XSPEC versions might not include ISM absorption edges or spectral models at the high resolutions appropriate for Chandra grating observations. Available optically thin, collision-dominated plasma radiative loss models have also generally only been tested in any detail for strong lines of abundant elements. Some prominent transitions in Fe ions with n=2 ("L-shell") and n=3 ("M-shell") ground states are not yet well-represented by some models. The spectral region 25-75 Å (0.5-0.17 keV) still remains largely unexplored, and both total radiative loss and predicted strengths of lines in this region are more uncertain than at shorter wavelengths. Some additional technical limitations in MARX modeling of LETG+HRC-S spectra are detailed below. There is a discussion in Chapter 8 (HETG), Section 8.5.4, concerning the detection of an isolated emission line or absorption line that is also relevant to the LETG+HRC-S combination. This discussion is based on line equivalent width, which is appropriate for broadened lines and continuum features but which is more difficult to apply to simple modeled estimates of expected line fluxes. Additional formulae which are simple to apply are presented below. The units are Å rather than keV, Å being a much more natural unit of choice for dispersed spectra, and especially for the LETG range. Here we have made the important assumption that there is effectively no additional uncertainty in the estimation of the background B. Such an assumption may only be valid if, for example, the detector region used to estimate the background within the spectrum extraction window is much larger than the window itself. where sl is the source count rate in the resolution element centered at λ, in cts s−1, Aeff is the effective area in cm2, and Fl is the source flux at the telescope aperture, in photons/cm2/s. For Aeff, it is reasonable to use the total area obtained from the sum of + and − orders as illustrated in Figure 9.17. Raw source counts are estimated by multiplying this instrument count rate by an integration time. where b is the background count rate within the spectrum extraction window (i.e. "underneath" the spectrum) in the same resolution element centered at λ, in cts s−1. Equation 9.5 provides the expected relation that is valid in the limit where the background count rate b is small compared with the source count rate sl, that the signal-to-noise ratio scales with the square root of the exposure time. To make the exposure time estimate one needs to determine the background count rate, b. Since the spectrometer does not have infinite resolution, the flux from an otherwise narrow spectral line is spread over a typical line width, wl. For LETG+HRC-S spectra, a good estimate for wl is 0.07Å. This is somewhat larger than the FWHM value of 0.05Å listed in Table 9.1, but is more appropriate for calculations of signal-to-noise because it includes more of the line flux. For lines that are additionally broadened, simply use a value of wl that covers the region under the feature of interest. The background rate b is then given by the quantity b=wlb′, where b′ is the background rate in units of cts/Å /s. Background spectra for LETG+HRC-S from which one can readily estimate b are illustrated in Figure 9.22 Two scales are shown, one corresponding to b′ and one corresponding to b where a width wl=0.07 Å was assumed. Note the y-axis units are per 10 ks. These simple equations, which include the effects of instrumental background, can also be easily applied to observations of lines on top of continua, as well as to situations in which features of interest lie on top of higher (or lower) spectral orders (HRC). In these cases, the continuum or higher order flux acts as an additional background term-the count rate/Å due to these additional terms is simply added to b′. In this case one can of course simply chose a new bin size w′=Nw. Note also in the above equations that the background b′ is in units of cts/Å/s. PIMMS is best suited to performing rough estimates of total or zeroth order count rates, or estimating the fraction of zeroth order events that would be piled up. Some degree of caution should accompany PIMMS calculations of detailed quantities such as count rates within narrow spectral bands using the Raymond-Smith model. For example, line positions and intensities in this model were only designed to represent total radiative loss and do not stand up to high resolution scrutiny. Calculations using power-law and featureless continua are not prone to such difficulties, but are susceptible to other PIMMS limitations. One particular limitation concerns the background model for HRC-S, which in PIMMS is assumed to be a single average number per spectral resolution element of 20 cts/100 ks. This approximation overestimates the background at medium energies, and underestimates the background at lower and higher energies; see Figure 9.22. The best tool for simulating LETG observations, including cases where there are multiple targets in the field of view, is the MARX ray trace simulator, which permits study of any of the available Chandra instrument combinations. For cases requiring higher fidelity modeling of the PSF, simulations can be performed by first simulating the response of the HRMA using ChaRT (http://cxc.harvard.edu/chart) and then feeding those ray trace results into MARX to simulate the LETG and detector responses. MARX has an important limitation for LETG+HRC-S observations in that instrument, sky, and particle backgrounds are almost always significant (see Section 9.3.6 and Figure 9.22) but are not directly included and need to be simulated or otherwise accounted for by the user. Background can be simulated by approximating it as a flat field and adding this simulation to that of the source (see http://space.mit.edu/CXC/MARX/). Another way of simulating background is to scale the background in Figure 9.22 after adjusting for solar-cycle variations in the background rate. Figure 9.29: This figure shows the extracted 1st order spectrum for an 80 ksec observation of the AGN NGC5548. 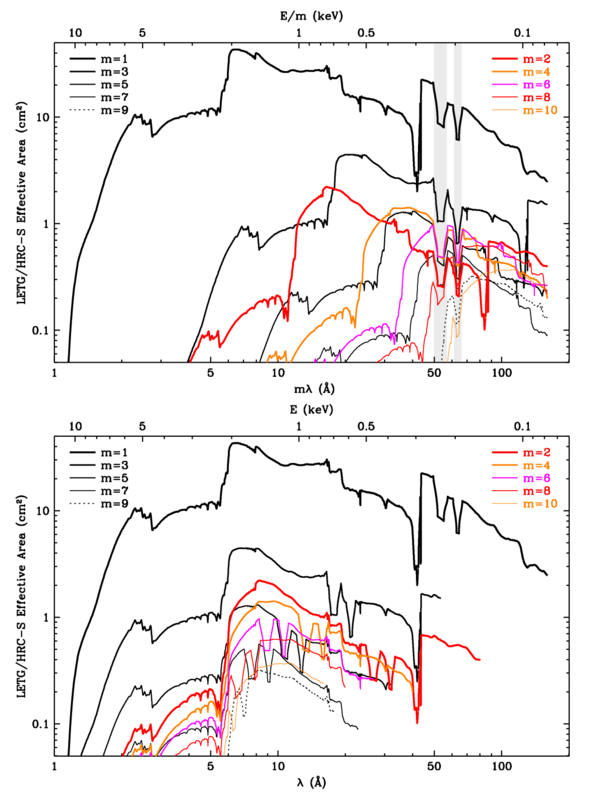 The input spectrum consists of a power-law plus a "warm" absorber (shown in the top panel). 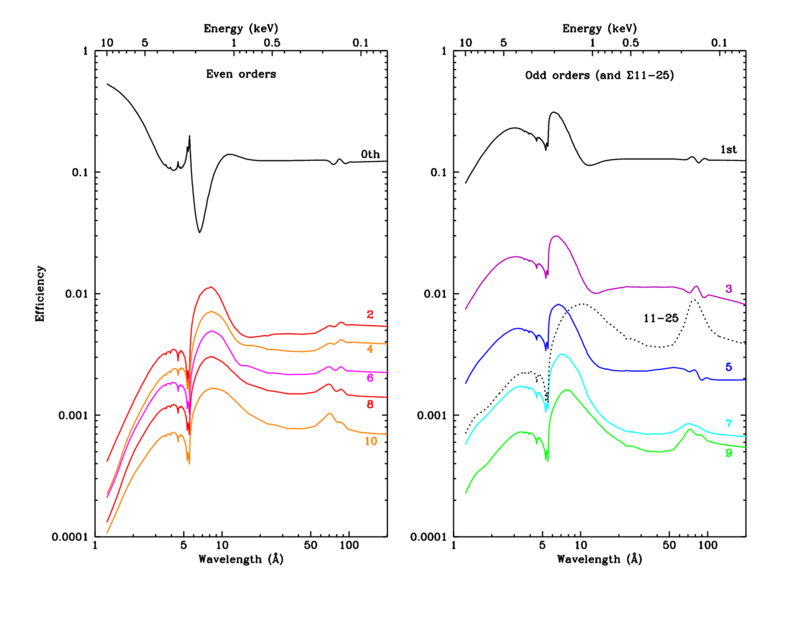 The simulated spectrum (bottom panel) has been corrected for the instrument response to give the flux from the source. Figure 9.30: MARX simulation of spectra showing the effect of source extent. The panels show (a) computed input spectrum, (b) a MARX output of LETG spectrum of a point source, (c) the same as (b) except that the source is a disc of uniform brightness with radius of 4", and (d) the same but with radius of 8". See Figure 9.11 and Section 9.3.3 for a discussion of extended sources. Further information on LETGS performance and calibration, along with relevant Chandra Newsletter articles, can be found on the http://cxc.harvard.edu/cal/Letg/ off the Instruments & Calibration web site (http://cxc.harvard.edu/cal/).